SUMMARY: After losing his day job as an office clerk, Lucas Barrett decides to become a full-time superhero in hopes of making a career out of it. 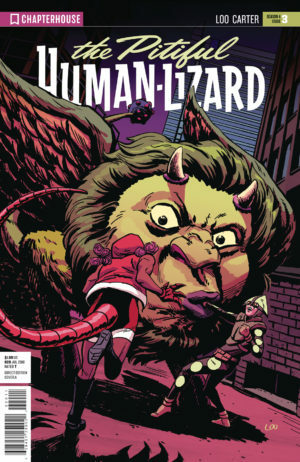 Maybe if the Human-Lizard is able to shut down the source behind Toronto’s monster activity, an organization like Equilibrium or PACT might take notice of his heroic efforts. Note: This story takes place before Invasion. COMMENTS: In a issue without an appearance by the Human-Lizard, Lucas tries to put his life back together. The Pitiful Human-Lizard’s trip to outer space, wreaked havoc on is civilian life. Kenneth retired as the superhero the Majestic Rat Lucas takes this event very poorly. Lucas also tries to reconnect with Yvonne. Lucas and Yvonne deal with their relationship in ways you could only wish Batman and Catwoman would have. When Lucas and Yvonne realize a super hero and a super villain can’t date because they have very different values, they then negotiate their post dating relations. What happens when the Pitiful Human-Lizard crosses paths with the Terrorno Grrls in the future. This comic explores what it would be like to really be a super hero in the real world with actual consequences for the choices you would have to make. Highly Recommended.